Did the Wizard cheat the Scarecrow? It’s that time of year – the time of year I start talking about right triangles and the world-famous Pythagorean Theorem. And, what discussion of the Pythagorean Theorem would be complete without telling my students about one the most important blunders in the “mathematical history” of Hollywood? Hmm … is he even trying to state the Pythagorean Theorem? Because, if he isn’t, he was cheated far worse than I thought! 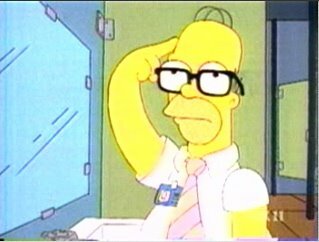 Not to be outdone by the Scarecrow, Homer Simpson repeats the infamous line in an episode of The Simpsons after finding a pair of glasses in a toilet. No sooner does he state it then someone tells him that it is for “a right triangle, you idiot!” While this is closer to the real thing, it still isn’t quite there. A few weeks ago, I wrote about how much I like “pseudo math” – the kind that looks like it is somehow important but, in reality, is nothing more than random mathematical symbols on the screen or page. Well, here is a classic example of just that. And, as I said before, I will take any kind of math, real or otherwise, as long as people are being exposed to it.